Hypnotism is that act of fixating a person so that he or she will react only to exterior orders. Posthypnotic suggestion consists of installing below the level of conscious awareness, an order, command or suggestion which the person, when again awake will obey. These are well-known actions. However, when it is realized that there are people who say they “don’t believe in hypnotism” when it has been a common activity for about two centuries, there should be no wonder that the public and even some hypnotists are unaware of a far more sinister mental phenomenon known as PAIN–DRUG–HYPNOSIS. Only about 22 percent of the population, according to some hypnotists, are susceptible to hypnotism.The rest are more or less immune to it. 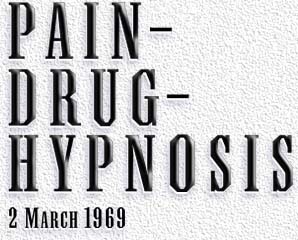 Pain-drug-hypnosis on the other hand is effective on 100 percent of the population. 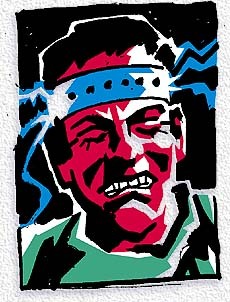 It often leaves a person mentally deranged. Hypnosis is a process, in effect, which works on a person already quite overwhelmed. The action of the hypnotist is to fixate such a person’s attention and cause the person to react only to the orders of the hypnotist. The mechanism, not well understood before DIANETICS, is really quite simple. A “suggestible person,” (one who can be hypnotized) is already one whose insecurity readily causes him to desert, when fixated, his own self-determinism and accept the other-determinism of a hypnotist. Even body sensations will “transfer,” as [Anton] Mesmer discovered in 1775. Any person placed in an emotional condition of terror, the most common emotion elicited in patients by psychiatrists with understandable reason, is fixated. He knows the psychiatrist in an institution will probably injure him severely or ruin him physically, sterilize him or depersonalize him.